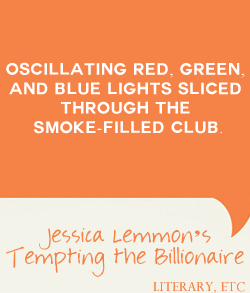 Today’s book is Jessica Lemmon’s Tempting the Billionaire and of my favorite books of 2013! Love the first line. All kinds of scenarios pop into my mind. I would HAVE to keep reading!!! Oh I liked this one too Jess! Loved the 2nd one. I’m a bit behind now though. *flails* Great pick for this week!